The Swedes, geniuses that they are, have long led the world in conquering the moose test. But here’s one thing they don’t seem prepared for: the kangaroo test. Volvo began looking into how autonomous vehicles would react when encountering animals over a year ago, and they noticed these marsupials a lot harder for computers to figure out than expected. It turns out the hopping of a kangaroo throws off the car’s detection system. The cameras and sensors aboard a self-driving car typically use the ground as a reference point. Volvo found that the system has a tough time predicting the random jumping movements of a kangaroo. Volvo, long the arguable world leader in car safety, is at the front lines in the unending battle between beast and automobile. Volvo’s Large Animal Detection system is already in use on the company’s 2017 S90 and XC90 models. The system watches out for deer, elk, caribou and, that menace to Swedish drivers, moose. 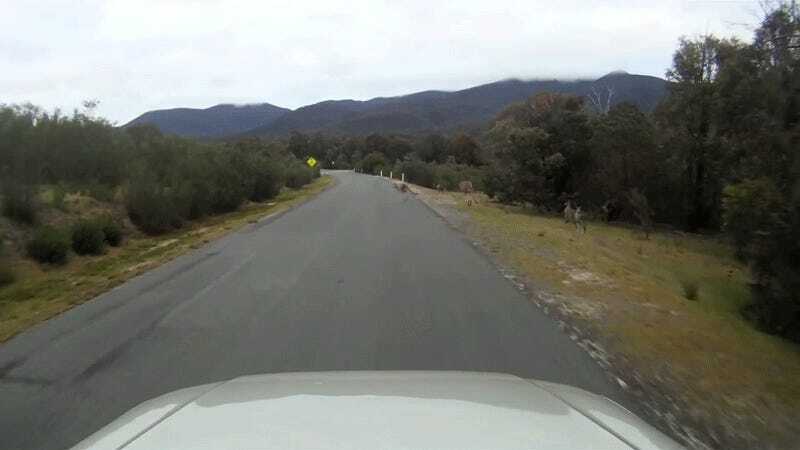 Volvo first began researching kangaroo collisions in Australia in 2015. Programming systems on how to spot a kangaroo’s movements is crucial to the introduction of self-driving cars in the region. Kangroos may not seem like as much of a threat as say, moose or deer, for example, if you live north of the equator. However, 80 percent of animal collisions in Australia involve kangaroos, according to Australian general insurer the National Roads and Motorists’ Association. The land down under isn’t the only place were drivers risk animal strikes on the road. Here in the U.S., crash deaths from animal collisions have been increasing over the past 20 years. The Insurance Institute for Highway Safety reported 186 deaths from animal collisions in 2015, up 75 deaths or 84 percent percent since 1995. The 1.5 million total deer-vehicle total collisions each year results in tens of thousands of injuries and over $3.6 billion in vehicle damage.